On the 'ish forum, we were discussing different kinds of yeast that can be used in brewing. Last year I used lager yeast (from a beer kit) throughout the year, keeping a bit from the bottom of the bucket after each brew and using it to start the next one. This year, not having a beer kit to hand, I looked at sachets of brewing yeast, decided that a pound for a little sachet of yeast was a bit excessive, and bought bread yeast instead, which is much cheaper. I think at least one person in that forum conversation was a bit horrified by my inappropriate yeast! So far, I've had excellent heather ale and elderflower champagne from that yeast, but I none of the wine is ready yet, so I don't know how that will turn out. Since wine yeast is bred to tolerate higher alcohol concentrations, the bread yeast is likely to give up the ghost at about 12% abv, possibly before all the sugar's fermented. This is fine, as I'm not aiming for strong wine, but there is some concern that as it struggles in the toxic, alcoholic environment, it might produce off flavours. Two 2 gallon batches, each made with 8 lb blackberries and 2 kg sugar. The first batch uses bread yeast, previously used for mugwort ale and washed in sugar and water in between. The second batch uses half a 5g sachet of Young's red wine yeast. For the first batch, berries were picked on Sun 17th and Mon 18th Aug (4 lb each day); fermentation of 1 gallon started on Sun. For the second batch, berries were all picked on Tue 19th Aug and fermentation started that day. 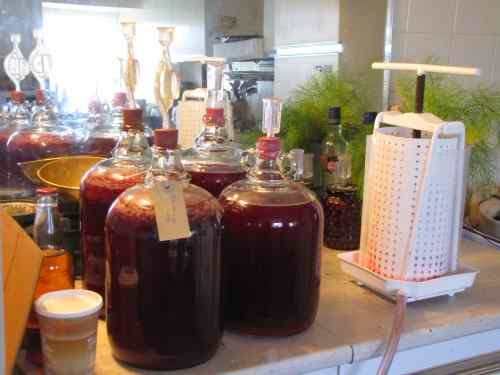 I now have four demijohns of blackberry wine bubbling away. By chance, I used two different types of airlock for the two batches, so I can use that to identify them. The ones on the left, with the old, one piece airlocks, are the first batch, with bread yeast. The ones on the right, with the new, two piece airlocks, have wine yeast. I'd only just filled the second batch, so you wouldn't expect it to be frothy yet, but in the buckets, it did seem that the bread yeast was a lot more lively. I suppose it's bred to produce bubbles, so maybe that's not terribly surprising. These will stay in the (relatively) warm kitchen for a few days before I take them down to the cooler store room. I might even take the first batch down first, to keep everything as similar as possible. Then we'll just have to wait and see what happens. I will conduct blind taste tests, and I'll let you know the results in a few months. Autumn arrived here last week. One day it was warm and sunny, the next there was a distinct chill in the air. We can't complain, because we've had a glorious summer, but it's a bit early, and it was very sudden. 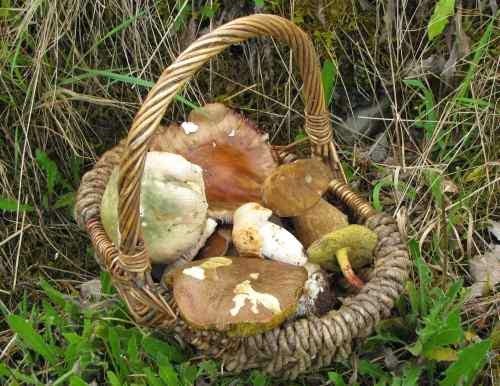 I've always loved autumn, and now I have another reason to love it: Mushrooms! There's a field near our house where the occasional field mushroom can be found. Coming home with a couple of these last week, I got chatting to a neighbour, who told me where he used to pick field mushrooms in great quantities, about thirty years ago. A few days later, I set off in search and sure enough, found field mushrooms. Not vast quantities, but a reasonable haul. I ate quite a few fresh and dried the rest. 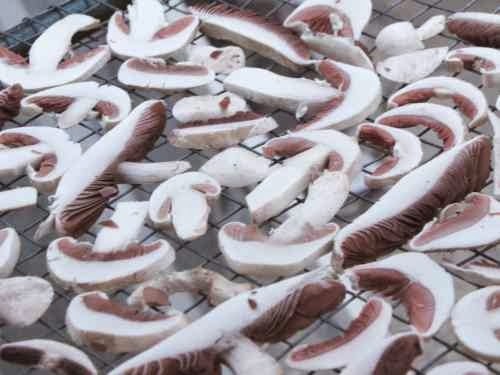 Field mushrooms on the drying rack. They were drying pretty well on the rack in the conservatory, but then the weather changed. Surrounded by humid air, the dry mushrooms started absorbing moisture again. Luckily, this only lasted a couple of days before the sun came out again, but I didn't want to risk that happening again. Once they were nearly dry, I brought them in and finished them off in a cool oven, which only took a few minutes. Isn't it a beauty? Over a couple of days I found four of these. One went on pizza (not the best way to appreciate its delicate flavour), two went into mushroom tarts that I took to a party, and one is drying. 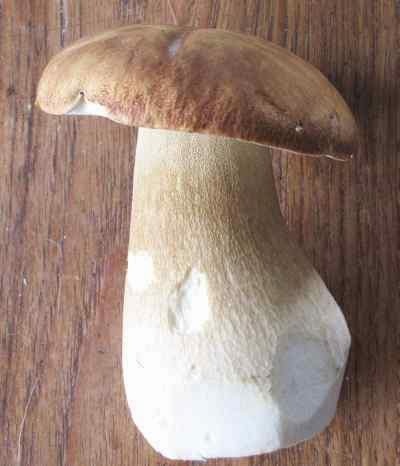 That's two more ceps, two greencracked brittlegills, two redcracked boletes, and three blushers. Not bad for twenty minutes' foraging. The ceps have joined the other one on the drying rack, and the rest I chopped and cooked with a few lentils, spring onions (I don't have any of the other kind at the moment), celery and a bay leaf. This should make a good mixture for padding out meat in stews or pie fillings. Of course, it would make a pretty good veggie stew in its own right, but my husband is not a veggie. Don't tell him I'm feeding him mushrooms, will you? Having got this far, I checked which Arduino pins I'd need for the SD card and LCD, and moved things around a little to free those up. This morning, I took a hacksaw to stripboard, heated up the soldering iron (I was going to write, Got out the soldering iron, but in all honesty, I never put it away), and applied solder as per plan. After moving things around, I found that I don't need the cut off piece of stripboard yet, but I will later. I'd like to have the sensors on plugs, so that I can unplug them if I need to take the controller out of the cupboard, for example to add extra bits. For the time being, I have short leads soldered to the board and I've twisted wires together to attach the sensors. It's all connected up now and it seems to be working. The pump came on as soon as I switched everything on, but that's what I'd expect if there was no signal from the controller*. The real test was whether it would switch off when required. After toying with the idea of taking the glass off the panel to cool it down, I made myself a cup of tea, then took the tank sensor out of the tank and held it against the hot cup. A much more sensible test, and it worked. After that, it clouded over, so I didn't get to hear it switch on again, but so far so good. I'm now studying how to add the display and SD card, so I'm afraid you haven't seen the last of these posts. For pumped solar panels, i.e. 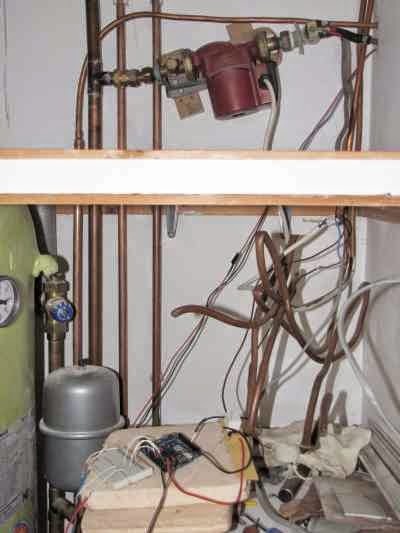 any that are positioned above the hot water tank they're supplying, it's necessary to have an electronic controller to turn the pump on and off as needed (unless, as we discovered with the basic panel, you're prepared to monitor it fairly closely yourself). This is a fairly standard bit of kit, and nicely packaged controllers with graphical displays can be bought for around £90 upwards. Less pretty, but just as effective, versions can be bought for about a third of the price. The option that appealed to me most (i.e. the cheapest), though, was to make my own. Those nice people at REUK not only sell controllers made to your specification, they also provide instructions for making your own. I'd had this webpage bookmarked for some time, but when I checked back a couple of weeks ago, I saw that they have a new design. 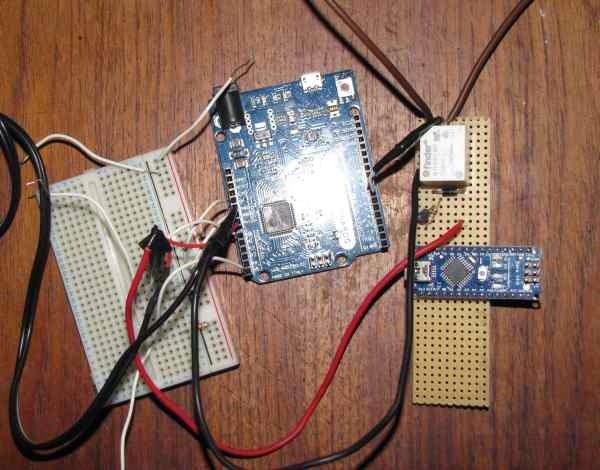 Instead of a simple comparator chip, the heart of the new design is an Arduino computer. Having spent much of my childhood helping Dad rig up various gadgets to our BBC computer, how could I resist having a tiny computer controlling my solar panels? REUK even have a nice tutorial explaining how to do it. Arduino is an open source project, so whilst the official boards start from €12.00 + tax - which is pretty cheap for a computer - it is possible to get copies that are even cheaper. This is legitimate, provided they don't claim to be the real thing (though I think the Arduino folk would prefer people to do interesting things with their designs, rather than just making cheap copies). There are many variations on the Arduino board available, so I was a bit bewildered by the options. I girded my loins and set about reading, in the hope of learning enough to understand what I needed. Luckily, there was a shortcut available. My friend Anita was visiting, and commented that her husband Dave would love my solar panels project. Ah... Dave... he's pretty hot on electronics, isn't he? 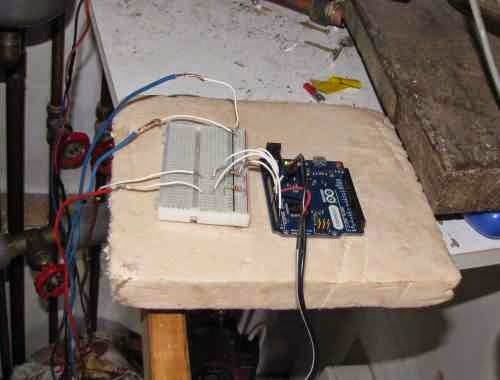 Does Dave know about Arduinos? Yes. Why don't you come over for a chat? I did just that, and Dave was not only able to add the voice of experience to my deliberations - That one doesn't have enough pins... That one's good value, and it has a free cable with it... That LCD package has extra stuff with it, you can get the basic unit much cheaper... and suchlike - he also had several Aduinos, and was happy to lend me one to play with, along with a breadboard (thing for plugging electronic bits into to make temporary circuits) and the half-dozen components specified in the REUK circuit. I went home feeling much more confident, and the next day I ordered temperature sensors (4 - I might as well get a couple of spares, while I'm at it), a power supply, and a relay from REUK, and an imitation Arduino board from some place in China. I also ordered an LCD display and an SD card socket from the place in China, because it would be kinda cool if I could also display the temperatures and record data, and neither was very expensive. 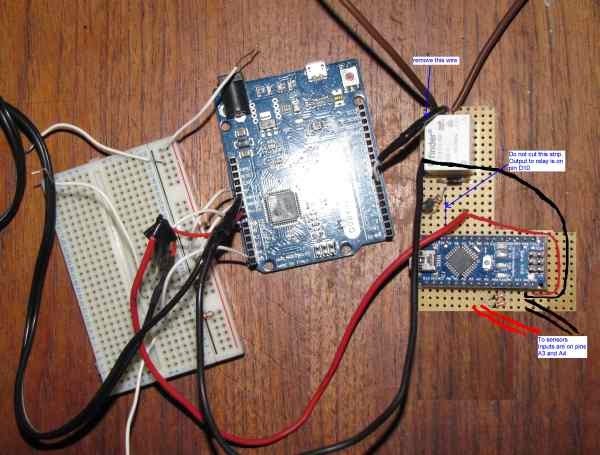 The items ordered from the UK arrived in a couple of days, and it was a fairly simple matter to plug a couple of temperature sensors into my borrowed Arduino, and the Arduino into my laptop, and get my first Arduino Sketch working. I was transfixed by the little light on the board, as I warmed up one of the sensors with my fingers to see the light to on, then cooled it by blowing to see the light go off. I could have watched if for hours. It's all very well watching a little light go on an off - that shows the computer is doing what I want it to - but that doesn't help much with my solar panel. 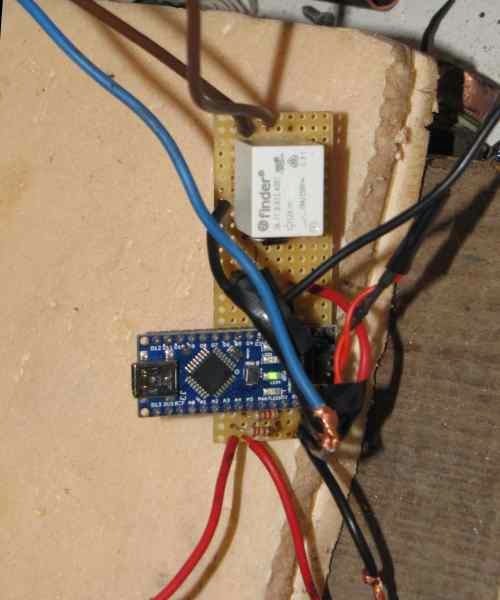 The next step was to rig up a couple of temperature sensors to some long wires (salvaged from the old washing machine. I know wire's cheap, but connecting pieces together gave me useful soldering practice) and put one in the panel and the other in the thermal store (tank). Connecting these up meant moving the control board into the cupboard. This required it to have its own power supply, as I could no longer run it off the computer in there, so I connected that up as well. I do still need to connect it to the computer if I want to change the program, which proves a little more complicated than you might imagine. The only shelf in the cupboard is rather high, so I have to stand on a chair to reach it. It's also rather cluttered, so there isn't space to put the laptop down, and then I need two hands to connect the micro USB cable to the controller board, preferably without knocking any of the other wires out of the temporary circuit. I had to ask Ian to come and hold the computer for me. Although it's not very clear in that photo, there are two LEDs on the board, a green one that indicates when the power's on, and a red one that I'd programmed to indicate when the panel is at least 6°C (I've since increased that to 10°C) hotter than the tank. So far so good, but this still required us to switch the pump on an off, and the LED wasn't very easy to see, what with the shelf being so high. The next step was to connect the controller up to the pump, via a relay. This part was a bit scary, as it brings me into contact with mains voltage (not literally, apart from that time I went to tidy up a stray strand of wire without turning everything off first). 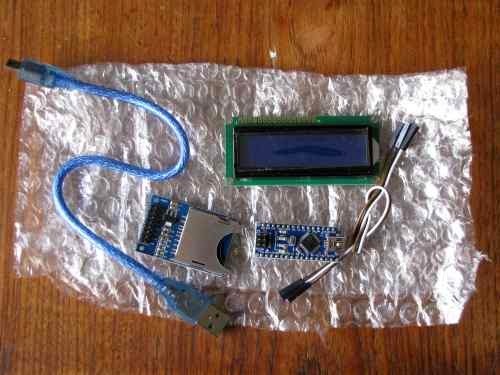 A while back, Dad gave me a soldering iron, some solder and a little bit of strip board. I think he meant me to use that to practise on, but waste not, want not, I went straight ahead and used it for the real thing. now with relay attached, to the right of the controller. So there it is, doing its thing. It really does, too! We've had sunshine and showers for the past few days, so I've been able to listen to it turning on and off all on its own, as the sunshine comes and goes. This part of the project has been almost disappointingly easy. With nice clear instructions from REUK, I haven't had to figure anything out for myself. I'm looking forward to my own Aduino-copy arriving, together with the display and card reader. When I have records of what the temperatures are doing, I'll be able to tweak the settings and see what effect that has. With my spare temperature sensors, I'll be able to look at things like how much heat is lost between the panel and the house, and how much difference insulation makes. In the meantime, though, I must get on with building the next solar panel.